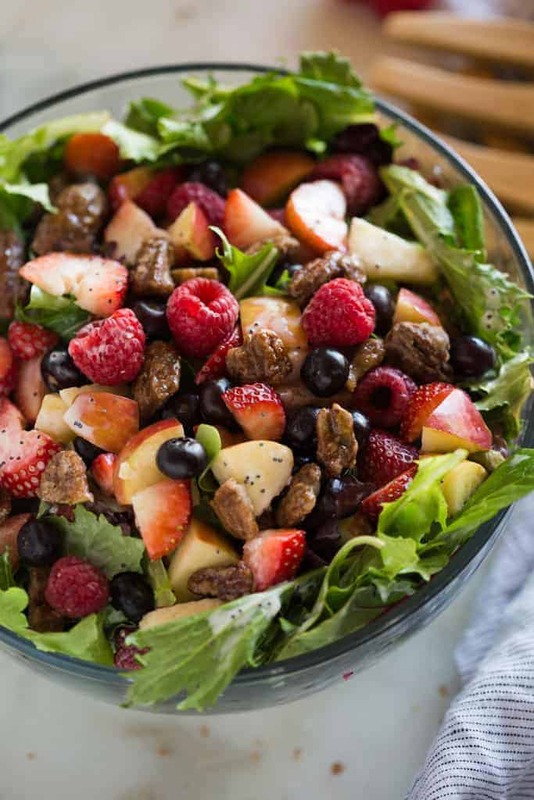 Beautiful, fresh and absolutely DELICIOUS Mixed Green Salad with Berries. This salad is the BEST! A bed of mixed green lettuce topped with strawberries, blueberries, raspberries, candied pecans, feta cheese and a creamy poppyseed dressing. The perfect spring and summer salad that is sure to win hearts. 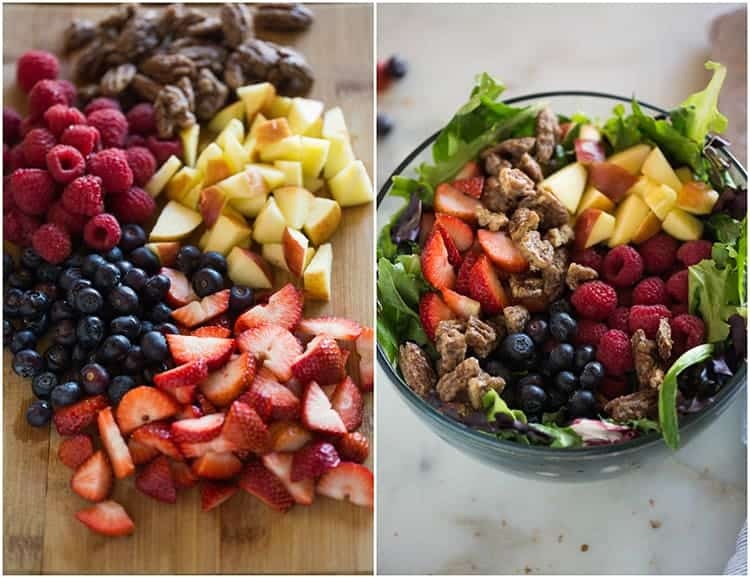 If you have a Cafe Zupas near you then you may have tried their “Nuts about Berries Salad”. It’s my FAVORITE, but my mom has been making a very similar homemade version for as long as I can remember. The salad starts with a bed of fresh greens. You can really use any type of lettuce you like. I like to mix several different kinds, or use a bag of mixed greens. Load the salad with fresh berries, some chopped onion, candied pecans and a sprinkle of feta cheese, if you like. 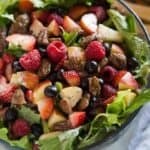 I just love the fresh berries combined with the crunch of the apple and the tangy and sweet dressing. Also, any salad that has candied pecans in it is always going to be a winner, right?! Candied nuts, also called caramelized nuts, are one of my favorite toppings on a homemade salad. If you don’t like pecans, you can substitute another type of nut or leave them out. My recipe for candied pecans includes a quick stovetop version that is great for using with salads, or an even tastier baked version. The salad dressing is really simple, and perfectly sweet, and you can adjust it easily to fit your preferred taste. Homemade salad dressings like this will keep well in the fridge for about 2 weeks, so feel free to make the dressing in advance! This salad is absolutely delicious, and it looks just as incredible as it tastes. 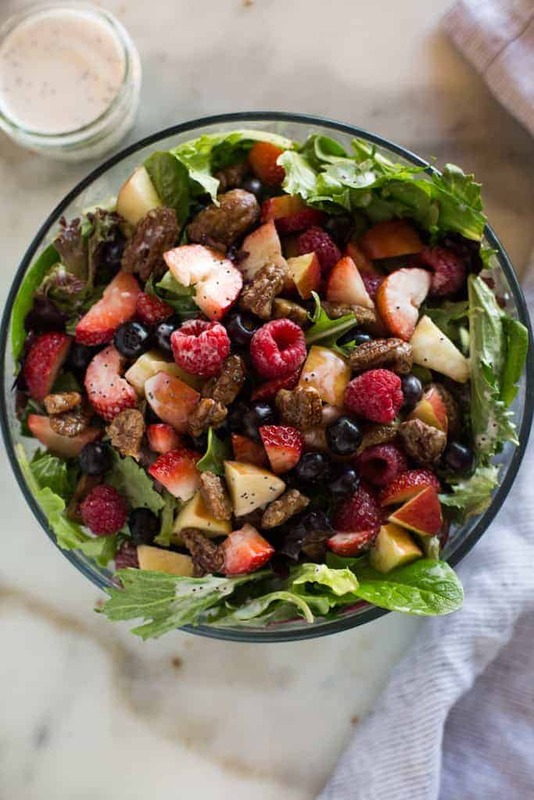 This Mixed Green Salad with Berries is to DIE for! A bed of mixed green lettuce topped with strawberries, blueberries, raspberries, candied pecans, feta cheese and a creamy poppyseed dressing. Add all of the dressing ingredients to a blender and blend until smooth. Taste. Add additional vinegar if you want it tangier, more sugar if you like it sweeter, or a dab more mayo and splash of milk if you want it creamier. Stir in poppy seeds. Store dressing in the fridge for up to 2 weeks. Toss the mixture in desired amount of dressing. Serve immediately. Love the ingredients ! Thank you! Do the pecans have to be candied?